Rayona Sharpnack is the CEO and founder of the Institute for Gender Partnership as well as the longstanding and widely admired Institute for Women’s Leadership. IWL is renowned for its 25 years of groundbreaking work throughout the United States, Australia, and Canada. 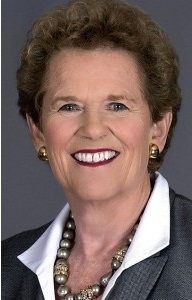 Drawing from her successful careers in education, professional sports and business, Sharpnack has become an inspirational teacher, coach and mentor for executives in Fortune 500 companies, government agencies, emerging businesses and non-profit organizations. Sharpnack has been unstoppable in her commitment to pollinate Gender Partnership in Fortune 500 companies and associations across industries. She has already made significant progress bringing the principles and actions of Gender Partnership to a number of Fortune 100 companies, which are seeing the financial, productivity and innovation benefits of men and women working together in true partnership. Sharpnack’s clients include Fortune 500 companies, government agencies, universities and nonprofits, including Pfizer, Gap Inc., Hertz, Cardinal Health, Teva Pharmaceuticals, Microsoft, Proctor & Gamble, Hewlett-Packard and World Pulse. Sharpnack’s masterful approach as a coach and educator helps her take very complex theoretical concepts and distill them down to poignant, relevant and easily accessible learning distinctions, which result in dramatically more effective leadership skills for her clients. More than 20,000 professionals from Fortune 500 companies have relied on her to produce breakthrough results both at work and in their personal lives. National publications, including Fast Company and The New York Times, have showcased her leadership model. She has delivered literally hundreds of keynote speeches, and designed large conferences focused on the topic of developing extraordinary leaders who know how to profit from Gender Partnership. 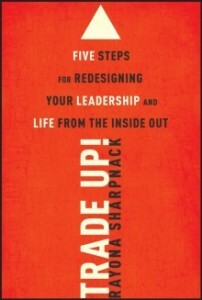 The core of Sharpnack’s success is a methodology she calls The core of Sharpnack’s success is a methodology she calls Leading by Context™. This paradigm-shifting approach is detailed in her book Trade Up: 5 Steps for Redesigning Your Leadership & Life from the Inside Out. Trade Up! is also available as a CD or MP3-downloadable audio book! Trade Up has enjoyed a great deal of success with individuals and organizations across the U.S. and internationally. Sharpnack is also one of several featured authors of the groundbreaking book Enlightened Power: How Women Are Transforming the Practice of Leadership and Goddess Shift: Women Leading for Change, along with Michelle Obama and Oprah Winfrey. In addition to numerous awards, Sharpnack was inducted into her High School Alumni Hall of Fame and was a finalist in the Silicon Valley Woman of Distinction Awards. Her innovative work earned her an appointment as Chairwoman of Leadership Development for Harvard Kennedy School’s Women’s Leadership Board. Sharpnack spends much of her free time playing sports and living a healthy lifestyle. As shortstop for the California Express women’s senior softball team, Sharpnack helped the team claim the runner-up position in two softball world championships. The crown jewels of Sharpnack’s life are her daughter, Chelsea (who inspires, challenges, coaches and generally keeps her mom in a continuous learning mode with respect to the power of negotiating win-win solutions) and her granddaughters, Brynnley and Isla Grace, who can make any day a perfect day with their amazing smiles. "After 25 years of addressing the business case for advancing women, I can honestly say that it is our results on improving a company's business performance that keeps corporations coming back to us for leadership training for women and their male partners." "Yes, we help them with recruitment and retention, but the people at the top lie awake at night worried about issues like competition, growth vs. cost containment, and quality vs. speed-to-market tension." "But when we can show them that empowering women as leaders and engaging men to advance women not only addresses but solves those business challenges, then they are willing to invest time and money."